The ‘Walled City of Baku with the Shirvanshah's Palace and Maiden Tower’ comprises the remains of a medieval town, that has been the capital of Azerbaijan since 1191. The Old City within the walls is a maze of narrow alleys, with ancient residences, stores and mosques. 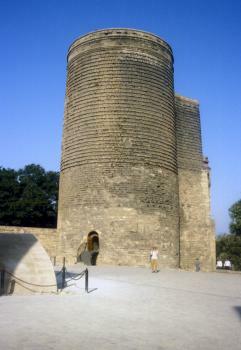 It also harbours the Maiden Tower, a cylindrical eight story structure 29.5 meter high. The Shirvanshah’s Palace, also located within the medieval area, is the most prominent example of Azerbaijan architecture from the Shirvanshah dynasty. It seems to have been developed mainly as a memorial complex rather than a residential palace. It holds mausolea, pavillions, a mosque and a bath-house. Azerbaijan isn’t exactly a tourist magnet, but it does try really hard to reach out to the world. In a few weeks time it will stage its first Formula One race (on a street circuit just like Monaco! ), and it has been host to the European Games and Eurovision Song Contest in recent years. Its capital Baku houses half of the country’s inhabitants, and is a sight to behold. A relatively small part of it, the Walled City of Baku with the Shirvanshah's Palace and Maiden Tower, has been designated as a world heritage site. Despite the "Walled" epithet, the medieval city center isn’t fully enclosed anymore. Only the western and northern side still are fortified. In our timeline we put ‘12th century’ as the age of this WHS, derived from the construction date of the landmark Maiden Tower. This tower lies on the edge of the old town, at a stretch without a continuing wall. It has a peculiar cylindrical shape, with a rectangle brick structure attached for additional stability necessary in this earthquake-prone region. It is climbable via an inner staircase, you’ll see that there’s a cistern hidden inside. The whole site is easily walkable and low on traffic. There are many restaurants on hand for a tea break or a kebab, and there is outdoor art (some of it Soviet-style). Somehow I had expected more of a ‘medieval town center’-atmosphere, but most of the buildings are from a much later date and/or don’t have their original purpose anymore. In this way Azerbaijan has similar ‘problems’ as the Gulf States – while now they have the funds and self-consciousness to celebrate and preserve their ways of the past, most of these have been demolished or died out. The core zone for example has several hammams, but none is in use anymore (“All the houses have bathrooms now!”, exclaimed our over-enthusiastic guide). When you use your imagination (a lot), you can see there’s a hint of Silk Road cities like Bukhara here. But especially the long Russian dominance has erased a lot. Probably also a result of Soviet times is the low-key existence of mosques. The call-to-prayer has been forbidden in Baku for example (although I heard it during my stay). While the old Uzbek cities are full of ostentatious religious monuments, Baku’s old town Friday Mosque is easily overlooked. The second main monument inside the walls, the Shirvanshah’s Palace, housed the rulers of medieval Azerbaijan when they moved their capital to Baku in the 15th century. 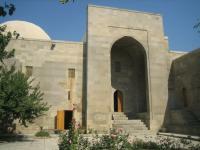 The complex consists of several elements, including its own mosque plus minaret and mausolea. The main residential palace can be visited but is rather bare. Its façade is covered with bullet holes stemming from "soldiers shooting training", or the inter-ethnic conflict in 1918 known as March Days / Azeri genocide by the hands of Armenians (all depending on who you ask). During my visit I came exactly to the same conclusion about Baku as Solivagant did more than 10 years before: while the walled city center is worth a visit, the real attraction of the Azeri capital lies in the ‘modern’ town. There you can find many monumental late 19th century constructions in (mostly) neoclassical style, testimony to an earlier oil-boom. These buildings have found new functions and are well-cared for, especially the facades are splendid. The Azeri’s also use this succesful window-dressing technique to hide uglier building fronts from the Soviet-period. Devotees to modern architecture will find in Baku a masterpiece like the Heydar Aliyev cultural center, done by the recently deceased Zaha Hadid. And the three elegant Flame Towers will draw your attention from afar, especially when illuminated in the evening in yellow & red. Both constructions were only finished in 2012, and these are just two of the highlights. More are on their way - until the natural gas & oil money runs out I guess. The Walled City of Baku was the other WHS in Azerbeidzjan we visited, including Shrivanshah's Palace and the Maiden Tower. Pity, the restauration activities made the tower almost invisible. +39 an humid was my first impression of Baku, the largest and most cosmopolitan city by the Caspian Sea, a city that easily could become a major tourist resort if the tourist hotel was in place, houses refurbished and the oil industry somewhat more careful about polluting the water. The actual World Heritage Site, the Walled City of Baku with the Shirvanshah's Palace and Maiden Tower, is located in the centre of the town, next to the Fountain Square and the main shoppingareas on Nirzami Street. The Shirvanshah’s Palace has been recently refurbished and together with the Maiden Tower and Caravan Saray’s, it provides an excellent image of life of the mid-15th century and days of the Silk Road trade. My stay in Baku lasted for a week which also provided me with the opportunity to see more of the Absheron peninsula where Baku is located and the south and northwest of Azerbaijan. Everything in Baku is centred around oil since the mid 19th century when the Swedish Nobel brothers together with other oil-prospectors basically started the world-wide oil-boom ou of Baku. But even before these days, the Baku area was filled with oil-related phenomenas. Today you can visit Zoroastrian Astegah Fire Temple, a sacred temple since the 6th century as well as burning mountains besides finding thousands of “donkeys” – oil-pumps working 24/7 delivering the black gold. My traveling also took me further south, to Gobustan where you find strange nature phenomenas as mud-volcanoes and the over 12.000 year old petroglyphs (listed on the tentative World Heritage Site), over 6000 rock carvings, witness of ancient mans’ civilization by the Caspian Sea. When I later headed north of Baku, to the small town of Quba, I found myslef in the mountain landscape of the Caucasus, reminding me more of Norway and Austria than Azerbaijan. Taken as a whole Baku is, in my opinion, “worth a journey”. 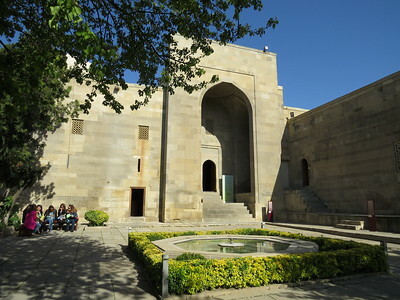 However, the medieval part of it, which has been inscribed as a WHS site, is not particularly notable or interesting in itself – “worth a visit” for an hour or so if you are already there but a bit lost in the modernity of Baku and lacking the scale and atmosphere of some other such Central Asian medieval cities. Perhaps its most amazing aspect is that it even survived the changes in Baku during the Oil boom and the Soviet era. Baku is not just a beatutiful city but it's a unique one. extraordinary cultural experience, friendly people, beauty of the Caspian sea will indulge you to stay there as long as possible. human beings live only once and there are things that we ought to see before we die and Baku, Azerbaijan is one of them. Lowest (below sea level): -28 m.
Golden Horde: "The city also traded with the Golden Horde,"
Mosque: 17th-century Kasumbek Mosque, the Palace Mosque (1441), mosque of Key-Gubad. Sufism: The Shrivanshah dynasty were patrons of the Halwati Sufi order and Baku became their cultural and ultimately, with the building of the Shirvanshah Palace in the 15th century, their physical capital. That palace "is believed to be a memorial complex built around the sacred place of worship (pir) and a tomb of Seyyid Yahya Bakuvi who was a Helwati Sufi saint.. After the Safavid conquest of Baku in 1501, the Sufi order was expelled"
99 Community Members have visited.